Post by VA'A NEWS TAHITI. Remember the name “Niuhiti Buillard” because you’ll probably be hearing it a lot more in the future. The 22-year-old Tahitian has just taken out the Beach Race/Distance Race double here at the Manuia 404 SUP Race in Tahiti today. And against some world class opposition I might add. Starting alongside big name stars such as Danny Ching and Georges Cronsteadt, along with a host of frighteningly-talented local dark horses, Niuhiti absolutely blitzed it. This guy reminded me of a quiet, unassuming Connor Baxter as he powered his tall, bent-over frame around the course in the morning and along the coast during the afternoon’s distance race. The scariest part: Niuhiti has only been paddling stand up for 12 months. Sure, he’s got a decade of experience in Va’a (Tahitian outrigger canoe paddling), which is an exceptionally good base for SUP, but still, I’d say this guy has plenty of room for improvement. In that way he’s quite similar to New Caledonia’s Titouan Puyo, who burst onto the scene in a big way this year after just 12 months of stand up paddling. Niuhiti also dominated the 32km SUP marathon at last week’s crazy Ironmana event on Bora Bora, showing that his pair of wins this weekend were no fluke. And there were more great performances today from a host of other potential world-beating locals that barely rate a mention outside Tahiti, highlighting the amazing potential this island holds. Hapowa Mai took line honours in the Beach Race (which was basically a Battle of the Paddle Elite Race-style course) on his 14 footer (Niuhiti was 12’6) and backed it up with a 4th-place in the Distance event. This guy is just 19-years-old and clearly has a strong future in the sport if he wants it. Bruno Tauhiro – a revelation at the Gorge Paddle Challenge back in August – was in prime position to take the Distance Race victory before a late surge from Niuhiti. Bruno crossed the line a close 2nd and showed he will be hard to beat as he focuses on SUP full time next year. This machine of a competitor, just like almost every other stand up paddler in Tahiti, grew up in the world of Va’a and was a member of the almighty Shell team has dominated the Molokai Hoe for the past decade. In the battle of the 12’6 Beach Race (the Beach Race was a mix of 12’6 and 14′, while the Distance Race was almost all 14′), Enzo Bennett challenged Niuhiti the hardest before eventually settling for 2nd in the 12’6 class / 3rd over the line. Enzo’s brother Rangitea, who wasn’t racing today, is apparently another prospect. One of the biggest names in the race and Tahiti’s international hero, Georges Cronsteadt, took 3rd in both the Beach and Distance races. Taking the podium double in this event would normally be something to cheer about, but Georges clearly wasn’t happy with his result and will be keen to reinstate himself as Tahiti’s #1 SUP racer in 2015. The raging bull has been afflicted with the local mosquito virus (Chikungunya, or “schicken guru” as I’ve become known for incorrectly labeling it) the past week or two and was physically below his best today. Tamarua Cowan – the all round champion at last week’s brutal Ironmana event – didn’t have his best result in the Beach Race but finished a strong 5th in the distance event. Tamarua has already gained experience competing in Hawaii and California and seems to have an incredible, all-round athletic ability. Definitely another name to watch and another Tahitian that will surely be plucked by one of the international teams before too long. Teva Poulain, or the petit cheval as he’s affectionately known, paddled hard to all day to finish 4th in the 12’6 Beach Race and 7th in the long, hot, flat distance race. The distance event had been advertised as a downwinder. It was anything but. Teva is a sailor while both he and Tamarua have pro cycling backgrounds, which makes them the exception to the rule in a nation where almost every SUP’er comes from the outrigger community. Georges’ brother, Yoann Cronsteadt, was the 5th fastest 12’6 in this morning’s Beach Race and finished 6th in the distance event. Other strong performances came from Eric Leou-On, Tahianu Mahaa, Raihei Tapeta and probably quite a few other local dark horses that I’m forgetting. Start of the Beach Race. Video screen grab thanks to Matarai. You can see that a small group, including Danny and Georges, started to the left of the inside reef, whereas the rest of us started to the right. Due to currents and waves, the left proved to be a solid disadvantage, highlighted by the lead that the main pack has in this frame. And if that wasn’t enough, two of Tahiti’s most talented young outrigger paddlers that have crossed over into SUP weren’t even racing today. Keep an eye on the names “Steeve Teihotaata” and “Rete Ebb” – 1st and 3rd respectively at this year’s Molokai OC-1 race and regular podium-getters in Tahiti’s famous Super Aito race. 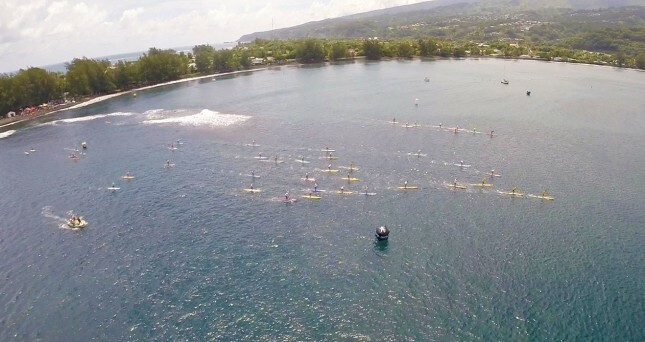 I’ve also been hearing that the entire EDT Va’a squad (Steeve and Rete’s team and the all-conquering winners of both the 2014 Molokai Hoe and Hawaiki Nui events, probably the two most prestigious races in the world of outrigger canoe) has been sponsored by Starboard Tahiti and will be cross-training with SUP during the off season (which basically begins now and runs all through the Tahitian summer).